Environmental Report: Worth a read! For almost 20 years, I have been the contact person for environmental care at LSG Sky Chefs. In 2008, we developed a structured and expansive Environmental Management System which is still considered unique in our airline catering industry. One of its fundamental features is the Environmental Report. The latest edition of our Environmental Report has just been completed and I am very proud of it. This year’s report – by the way LSG Sky Chefs was the first airline caterer publishing such a report – has a new design in a fresh, light and colorful way. Content wise we describe our Environmental Management System and have a dedicated focus on our remarkable achievements with regards to savings in water, energy and waste over the past five years. I am sure you will find the four best practice cases in the report a good read. The cases cover the production of our own energy in one of our Frankfurt facilities, the zero-to-landfill project in the U.S., the development of an electronic drive system for highloader trucks and the further roll-out and development of our SIMBA dishwasher software. The mentioned best practices are good examples of our continuous improvements across our network in regards to setting an eco-friendly footprint. 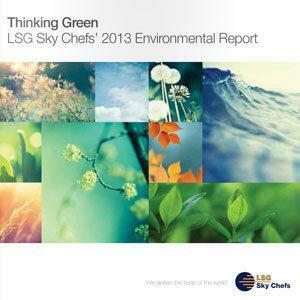 Did you know, that LSG Sky Chefs has been publishing an Environmental Report on an annual basis since 2010?